At this farm spring means piles of seed packets and notes on garden plans on literally every surface, including the floor. Plus shelves full of lights and little plants, our hope for the summer. It seems like a total hassle and kind of a disaster zone but I wouldn’t have it any other way. 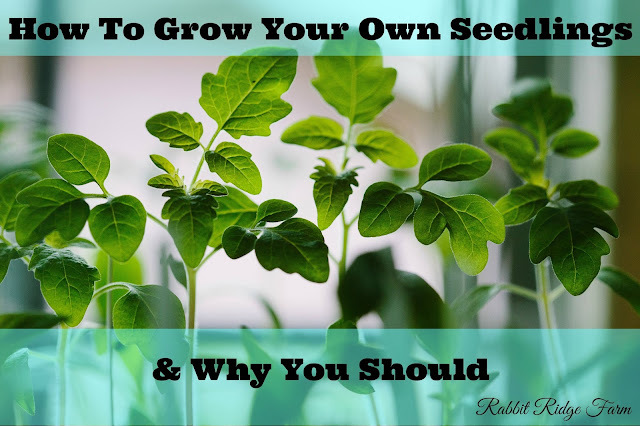 If you’re thinking of starting your own seedlings this year here are some things you may want to consider. First of all you can grow any of variety you want like our five favorite heirloom tomatoes. If you buy your seedlings at some big box store there probably won’t be many varieties to choose from. They’ll also be much more expensive. I’ve seen even smaller seedlings go for a dollar a piece compared to paying $2.99 for 50 heirloom tomato seeds. You also have very little control of the quality. You don’t know how long those plants have been in those tiny pots, where they came from, or what type of care they received. It also almost guaranteed that they’re not certified organic. We use plastic flats that aren’t too pricey but I’ve seen people make newspaper pots, use egg cartons, or any old containers they have on hand. Search Pinterest for a plethora of ideas. We buy organic seeds and I’ve purchase them from Seed Savers Exchange, Johnny’s Selected Seeds, High Mowing Seeds, Southern Exposure Seed Exchange, and Seeds of Change all with good results. With open pollinated seeds you can save even more money buy saving some each year! There are many other great organizations out there we just haven’t personally tried them yet so feel free to shop around. There are variety of potting mixes available. We have used several different ones. We always look for something that is peat based and OMRI (Organic Materials Review Institute) certified. Many people make their own mix. 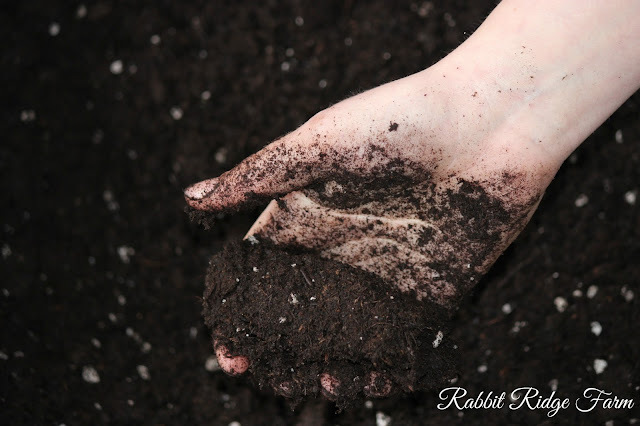 A common one is screened/well mixed peat moss, sand, and compost. Some people use pearlite in their mixes and others use straight compost. There are tons of recipes available, just google it. When you’re making you decision remember that ultimately the most important thing is good fertility. We use shop lights and it’s super important your plants get enough light. Setting them by a window really isn’t enough! When purchasing a shop light find one that is not LED. These are cheap though you could just poke holes in a milk jug’s lid. We grow a lot of seedlings so we have a pretty big shelf an hope to add more in the future. I also like our shelf because it is easy to hang the shop lights off of. I also highly recommend a shelf with adjustable levels so you can easily change how close your plants are to your lights and if you can find a shelf thats as wide as your lights are long it works perfectly! ** At the bottom of this post and on each item name I have included affiliate links to products that are similar to the ones we use. I could not find the exact matches but this will give you an idea. If you choose to buy them I receive a tiny percent at no additional cost to you. It’s just how I help keep this blog running! Now that you have all your supplies you can begin preparing your containers or flats. We dump our potting mix into a tote so it’s easier to work with. You’ll want it to be moist enough that when you squeeze a handful it should sort of clump together (as pictured above) but not so wet that you can squeeze any water out. Then you can fill your containers. I fill mine then tap the flat on the ground and push the potting mix in gently with my fingers. If you don’t pack it in well as soon as you start planting and watering you’ll need more. Being able to pack soil in well is one of the reasons we use the plastic trays. 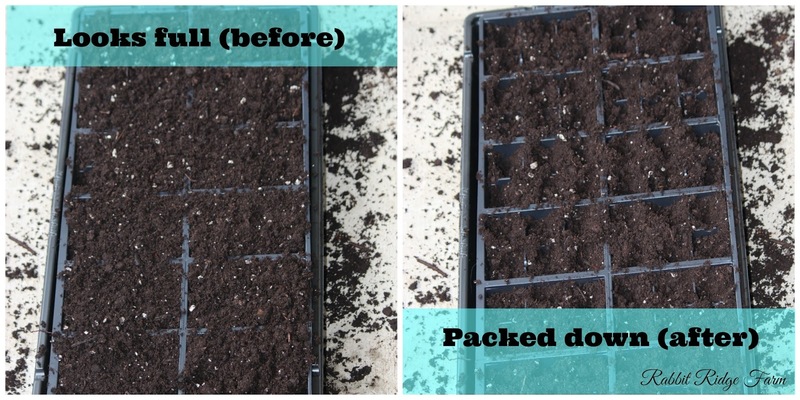 Below is before and after I pack the potting mix in gently with my fingers. See how much more soil I needed to add? 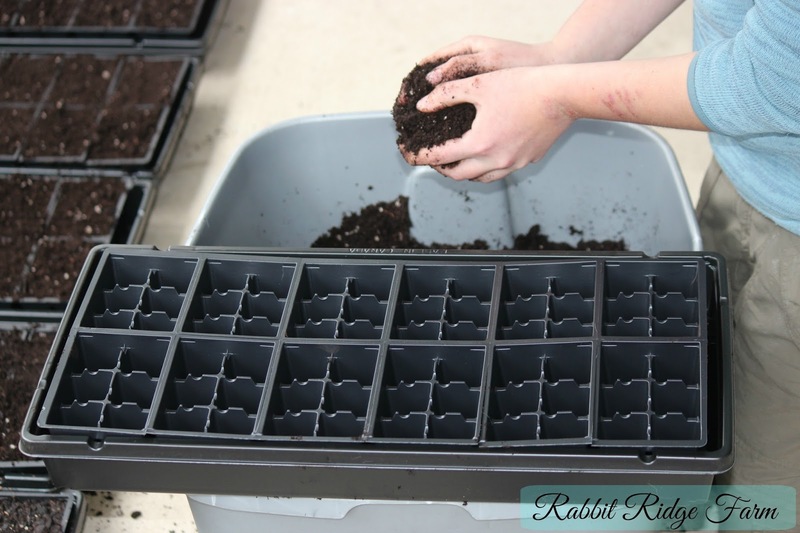 Once you get the trays full you’re ready to plant. The directions for planting will be included on your seed packets. They’ll be information like planting depth, optimum germination temperature, and germination time. If you have trouble keeping the plants warm enough there are seedling heat mats available. We often use one under our peppers. Once your plants germinate you’ll have to keep up with their care. The lights should be kept as close as possible to the tops of your plants without drying them out out (no more than 3-4 inches away). If you don’t keep the lights close the seedlings will get “leggy” growing towards the light. They won’t be as healthy come planting time if they put all their energy into growing upwards. 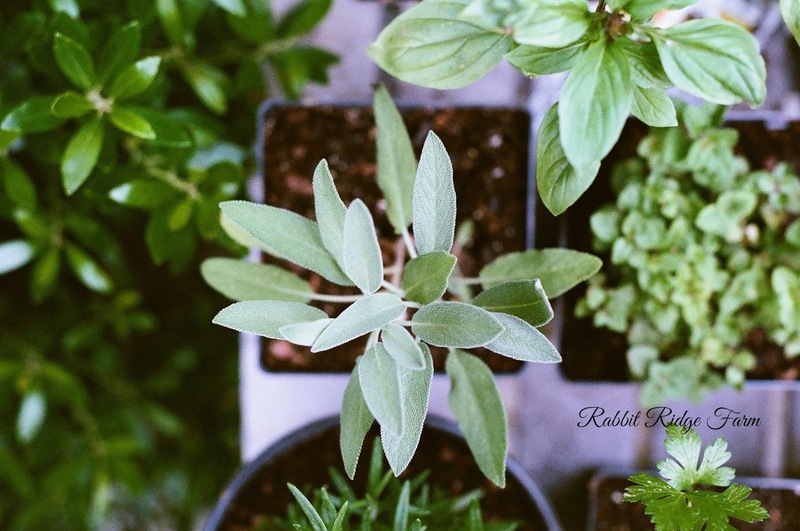 You’ll also need to ensure your plants stay moist but be careful not to over water them. They don’t want their roots soggy. As the seedlings get bigger you’ll notice they’ll need water more often. Some plants such as tomatoes tend to be heavy feeders and may need additional fertility. This can be done through potting them up to a larger size container, watering with compost or manure tea, or using liquid kelp meal. You can find our super easy method for making manure tea here. Was this helpful? Stay tuned for our next post on transplanting your seedlings!